Teachers understand one secret to a successful class is engaging their students. These fun animal-themed Listening First Headphones are built to do just that with playful Bear, Panda and Tiger patterns. Safety was a design priority for the Listening First headphones with slotted earcup baffles protecting the internal speakers against accidental perforation by sharp objects. Noise-reducing earcups rest around not in the ears to provide maximum protection against ambient noise so students won't increase the volume to hear the content. The rugged ABS plastic earcups won't shatter (unlike materials used in consumer electronics items) into potentially dangerous shards and withstand the rigors of daily use to help children remain focused on learning. The entry point of the cord into the earcup is reinforced and has in-line volume control for individual preferences. The 3.5mm stereo plug enables student listening to smartphones, tablets, computers and other audio sources. Creating a small group of differentiated learners is possible with the use of a stereo jackbox. 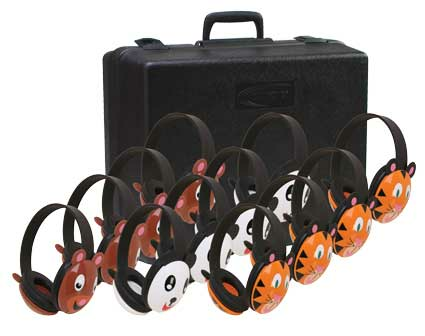 The Animal-themed Listening First headphones come with an industry leading two-year warranty and are available individually and in a classroom twelve-pack including four Bear, four Panda and four Tigers safely packed in a foam-lined storage case (2810-12). Adjustable headband comfortable for extended wear Specifically sized for young students Volume control for individual preferences Ideal for beginning computer classes and story-time uses Permanently attached with reinforced “strain” connection resists accidental pull out Lengthy 6 foot straight cord with 3.5mm plug set at right angle reduces accidental pull-out Around-ear ambient noise-reducing earcups deliver maximum protection against exterior sounds (without added electronic circuitry and expense). This reduces the need to increase the volume (protecting the ears) and helps keep students on task. Rugged ABS plastic earcups resist breakage in high-use situations Replaceable leatherette ear cushions iOS, Windows, Android compatible Three year warranty for school use - unlike headphones purchased at consumer electronics stores whose warranties would be voided if used in schools.